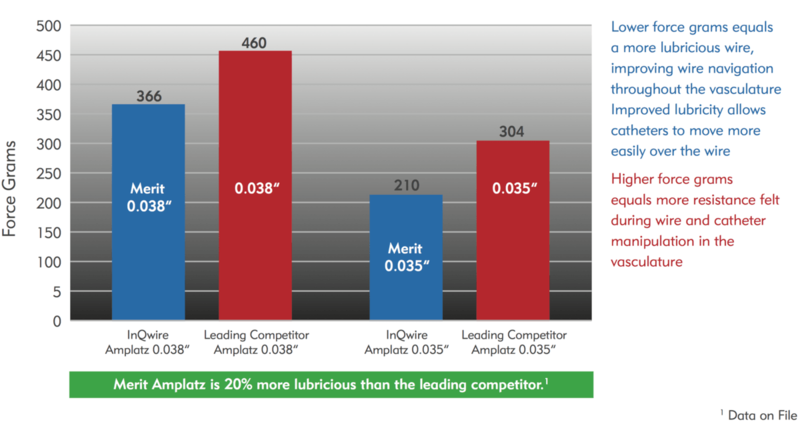 A new addition to the InQwire® product line is the Merit InQwire®Amplatz guide wires. The Amplatz wires provide an increased level of stiffness that delivers support and stability within the vasculature for enhanced navigation. Added stiffness also facilitates catheter placement and advancement of other devices such as dilatation catheters and stent catheters during contralateral access. A smooth tapered transition from the shaft to the flexible tip allows atraumatic negotiation of the most difficult anatomy. The Amplatz wires are available in multiple tip configurations to include straight tip wires in a variety of flexible profiles including 1.0cm, 3.5cm, 4.0cm, 6cm, and 7cm. A J3mm tip configuration is also available.